Atlantic Partners, Ltd. is active in the US, Germany, the UK and The Netherlands. It helps clients design and implement cross-border real estate strategies. The firm was established in 1995 by Bradley A. Olsen. 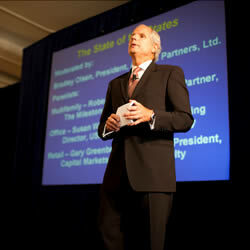 Mr. Olsen has been active in international real estate investment since 1980. He has advised investors from the US, Europe, Asia and Canada on investment transactions valued in excess of $5 billion. Atlantic Partners has advised investors from the US and Europe, including Achmea Real Estate, AMLI Residential Properties Trust, Behringer Harvard Real Estate Investments, Grubb Ventures, HCI Capital, KLM Pension Funds, Principal Real Estate Investors, TMW Real Estate and USAA Real Estate Company.